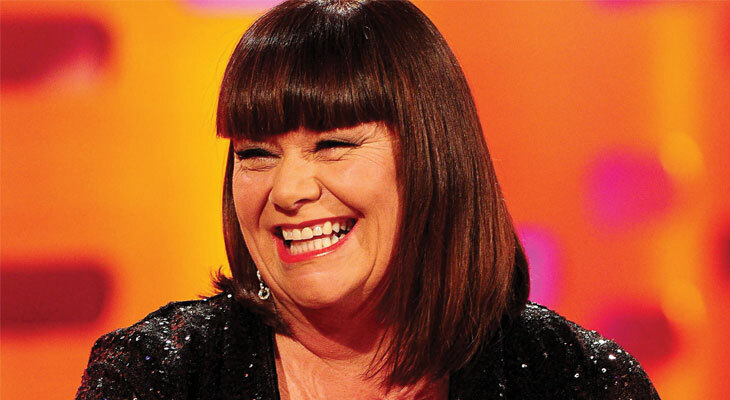 Last year 50 Plus Magazine caught up with Dawn French ahead of her UK tour ’30 Million Minutes’. Here’s what appeared in our magazines, written by Angela Kelly. We’ve got so used to seeing comic actress Dawn French in roles where she’s anything but Dawn French that her latest solo tour is proving a bit of a revelation – both to audiences and to Dawn herself. It’s called “30 Million Minutes”, which is the amount of time she reckons she’s been on this earth. But in what she describes as a “sliver of time between the madness of my menopause – now thankfully over – and the impending madness of my dementia” she’s boldly, and at times bawdily, going where she has never gone before. Dawn is 56 now, arguably the long-term holder of the title Queen of British Comedy, and an award-winning actress, best-selling novelist and all-round funny lady. She’s written this new show based on her life and career, all with a sharp eye for comic detail as you would expect and a wicked ear for the absurdities of life. Dawn French of Cornwall shares how she misguidedly spent her whole life vigorously attempting to be a fully functioning female human. Reviews of the show, now touring until the end of November from Nottingham to Southend and Bournemouth to Manchester, reveal a national ongoing affection not just for the characters that Dawn has played which have passed into entertainment folklore but also for Dawn herself. All of which is just as well because the show is a riveting 120 minutes about her life and, being Dawn, it’s not only larger than life but also deeply affecting. Her father gave her confidence, and she remembers a “key moment” when she was leaving for a party. “I’ve always been a big girl and shouldn’t really have been wearing hot pants,” she says. Bearing in mind that closeness, however, it’s not difficult to imagine how devastated she was at 18 when her father killed himself. Soon after her father’s suicide, Dawn started at the Central School of Speech and Drama in London to do a teaching course. There she met Jennifer Saunders, with whom she would form a hugely successful comedy double act. The pair began to make names for themselves on the alternative comedy scene in the 1980s and their long-running TV show, “French and Saunders”, launched in 1987 introducing us to their madcap world. Roles in TV – including the iconic lead part in The Vicar of Dibley – and in the theatre have followed. She also has an autobiography and two novels to her name, not to mention high-profile TV advertising appearances that have kept her in the public consciousness and firmly associate her with chocolate oranges and insurance. And, although these days she is far from spherical and is a beautiful woman, she will only admit that she is “less than I was.” Fortunately, there is a generally held theory that Dawn French is rightly not defined by her weight, simply by her talent. She had a much-publicised divorce from comedian Lenny Henry after 25 years together, but they have an adopted daughter and she says they still have a “great” relationship. After the split, she found – in her 50s – that she was going on dates. “I’m not good at flirting. I’m good at being coy. What I’d rather do is give a questionnaire out and get people to tick boxes,” she says, laughing. And, for the thousands of fans who will see Dawn in person around the country, discovering more about who she really is, this is a wonderful – and very happy – postscript to her life so far.